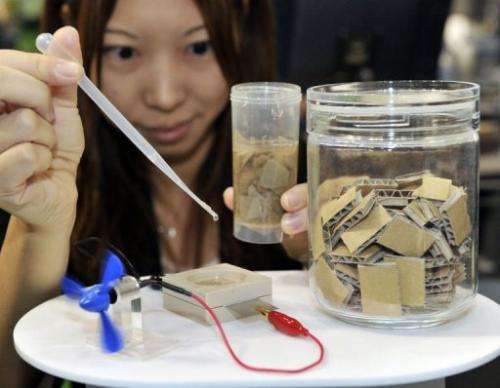 An employee of Sony demonstrates a new bio battery, generated from the cellilose of recycle papers, powering a fan (L) at the Eco-Products exhibition in Tokyo. Japanese electronics giant Sony on Thursday revealed technology that generates electricity from shredded paper. As an environmental products fair opened in Tokyo, Sony invited children to put paper into a mixture of water and enzymes, shake it up and wait for a few minutes to see the liquid become a source of electricity, powering a small fan. "This is the same mechanism with which termites eat wood to get energy," said Chisato Kitsukawa, a public relations manager at Sony. While academic research has previously taken place on this kind of power generation, proof-of-concept demonstrations are rare, he said. The performance was part of Sony's drive to develop a sugar-based "bio battery" that turns glucose into power. Shredded paper or pieces of corrugated board were used at the fair to provide cellulose, a long chain of glucose sugar found in the walls of green plants. Enzymes are used to break the chain and the resulting sugar is then processed by another group of enzymes in a process that provides hydrogen ions and electrons. The electrons travel through an outer circuit to generate electricity, while the hydrogen ions combine with oxygen from the air to create water. "Bio batteries are environmentally friendly and have great potential" as they use no metals or harmful chemicals, Kitsukawa said. But the technology is a long way from commercial viability because of its low power output. It is currently sufficient to run digital music players but not powerful enough to replace commonly used batteries, he said. Sony first unveiled test sugar battery technology in 2007 and has since reduced the battery's size into a small sheet. Another sugar battery was on display at the fair embedded in a Christmas card, which played music when drops of fruit juice were added to it. kind of a clever fuel cell. Still, right now it is just a science project. @that guy And the Wright Brothers' 'plane started as a crazy shed idea. With the support of Sony, and their partners, this will be a market changer in just a few years.